Some people are naturally good at finding fun new activities to keep themselves and others entertained. Not everyone is capable of constantly finding new and exciting things to do, and can be more caught up in the things they already know and enjoy. 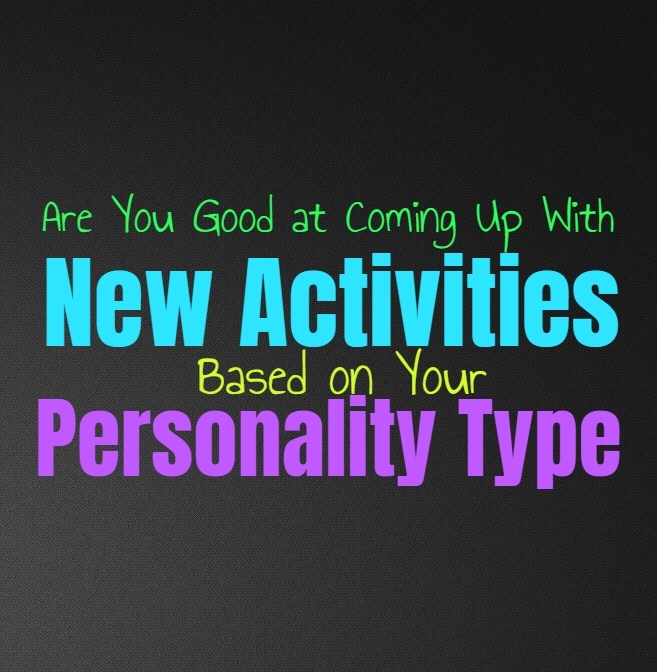 Here is how good you are at finding new activities, based on your personality type. INFJs can sometimes come up with fun things they like to do, even though it won’t constantly be new activities. For them it feels new if they get to share these things with someone they love, or someone they haven’t been able to experience it with. INFJs might enjoy staying within their comfort zone with some things, but that doesn’t mean they aren’t willing to experience different activities. For them it is easier to step outside of their comfort zone and really try new activities, when they have the right person along for the ride. ENFJs do like being able to use their creativity to come up with fun activities for everyone. They often do this in order to please their loved ones and care deeply about making them happy. ENFJs realize that coming up with new things to dive into can be rewarding, and so they do their best to be creative and unique in their ideas. ENFJs are very capable of figuring out activities which are tailored to their loved ones, since they understand people very well. For the ENFJ it is truly enjoyable to be the person who helps those around them have fun and experience joy in their lives. INFPs are great at coming up with fun new activities, and often have plenty of new hobbies and projects they want to dive into. INFPs become bored with stagnancy and so coming up with new creative activities is something that helps keep them from being caught up in the mundane for too long. They need to feel challenged and have ways to use their creativity in life, and so coming up with new activities is actually fun for the INFP. They are capable of seeing plenty of new things they could experience and so coming up with activities they want to try isn’t all that difficult for the INFP. Most of the time ENFPs can come up with plenty of things they want to do and experience in life. For them coming up with new activities is rewarding and enjoyable, since they are naturally creative people. For the ENFP coming up with new activities to try is certainly something they are capable of, but they do sometimes find themselves stuck in a rut. When the ENFP feels stuck they simply resort to the things they normally do, even though in their minds they have plenty of new activities they can dive into. INTJs are capable of coming up with new activities, but they aren’t always focused on doing this. They want to focus on things they know and understand, but at the same time they do want to seek out ways to learn and grow. They are capable of finding new activities, mostly from doing research and uncovering which ones might be interesting to them. INTJs do a lot of things based on their own research, rather than just coming up with ideas without really learning about them and weighing the rewards versus the cons. They believe in being prepared and in being sure they are making sound choices for their futures. ENTJs often come up with new activities by communicating with friends or simply by doing research. For the ENTJ thought it can become draining to constantly be searching for new things to try, as they do enjoy focusing on the things they know they already enjoy. They aren’t afraid of experiencing new activities from time to time, but they find themselves often drawn to what they are comfortable with and can learn plenty about before diving in. INTPs are great at coming up with new activities and experiences, especially since they hate feeling stagnant. INTPs often imagine plenty of new things they want to try in life, but that doesn’t mean they always find the time to dive into them. They usually have long lists of hobbies and projects they know they would enjoy, but might not always find themselves taking that next step into those new activities. Their minds often bounce from one thing to the next rather quickly, and so they can become bored of things before they even try them. ENTPs are often good at coming up with fun new activities, and they enjoy being able to experience these things. When the ENTP becomes stagnant for too long it really does leave them feeling drained and a bit gloomy. They need to have options and new things they can try, and they are naturally creative people who can often come up with these activities on their own. They sometimes need to have people who are willing to dive into these hobbies with them, or else they can feel held back. ISTJs aren’t really fans of constantly having to come up with new activities, but that doesn’t mean they aren’t capable of it. They do have plenty of personal interests and are good at doing research. If the ISTJ feels like they need to experience something new they will spend time researching their options in order to figure out which choice is the right one for them. While they might not be seen as people who like to try new things that is not entirely the truth. ISTJs simply want to be prepared for what they experience so that they don’t make any mistakes. ESTJs are often more creative than people realize and they enjoy being able to experience new things from time to time. ESTJs simply want to be prepared for these experiences and don’t just like diving in without doing research. They want to know that they can navigate the challenges and actually be capable of taking on these hobbies without making any mistakes along the way. ESTJs do enjoy being able to prepare themselves for whatever they try, but that doesn’t mean they cannot come up with new activities for their family. ISFJs aren’t really fans of constantly having to come up with new activities, since they do enjoy sticking to what they know. For the ISFJ experiencing new things constantly can be overwhelming and leave them feeling a bit stressed. They need to be able to prepare themselves for what is to come, so that they don’t fear making too many mistakes. ISFJs are willing to try new things for their loved ones and are good at figure out what they might enjoy, but doing this often can be draining. ESFJs don’t really like constantly diving into new activities, but that doesn’t mean they aren’t capable of it. They are good at being creative for their loved ones, and deeply want to be able to help them experience life and enjoy themselves. When someone they care for is feeling bored and wants some excitement, the ESFJ is often good at coming up with new activities tailored to their personality. They do their best to be supportive even if it is sometimes challenging or unnerving for them. ISTPs do enjoy trying out new activities and they are often good at figuring out which things they might enjoy. They don’t like stagnancy and prefer to dive into things headfirst. For the ISTP it is best to experience life firsthand instead of allowing themselves to feel held back by fear. They are good at finding new activities and are often rather creative people. They just follow wherever they feel most inspired and don’t worry about the risks. ESTPs are good at coming up with new activities and are often interested in a lot of different things. They are capable of finding different activities and adventures they can dive into, and they love having someone who will join them along the way. ESTPs dislike feeling stagnant and can become bored rather easily with the same daily chores and activities. Because of this they want to be able to come up with new things they can try and new hobbies to experience. ISFPs do enjoy coming up with new activities and are often rather good at it. They don’t like feeling stuck in the same place and want to be able to experience thrills and excitement in their lives. They are certainly good at coming up with new activities which they can enjoy and even have their loved ones experience with them. Sometimes ISFPs enjoy hobbies and activities they can experience on their own thought, and this gives them time to recharge. ESFPs are excellent at constantly coming up with new activities, and seem to have this endless well of ideas. ESFPs want to experience fun things and they love having people who are willing to join them along the way. For the ESFP sitting around doing the same mundane things can become extremely boring and even a bit depressing. They want to be constantly thinking of new activities to experience, and they are often good at this.